Fuente Fuente OpusX Lost City, like many of Arturo Fuente's most prized offerings, arrives in the hands of cigar smokers with an intriguing, seductive backstory. Legend has it, when filmmaker Andy García was shooting "The Lost City" in 2004, he approached Carlos "Carlito" Fuente, Jr. in an attempt to film a scene involving a tobacco field. Due to tight scheduling, the scene was to be filmed in the summer, during the offseason for tobacco growth. But Carlito made special arrangements, replanting tobacco directly after the spring harvest, allowing for three-foot-tall tobacco to be seen in the film's final cut. When asked what he would do with the tobacco, Carlito responded, "If it is good, I will use it." 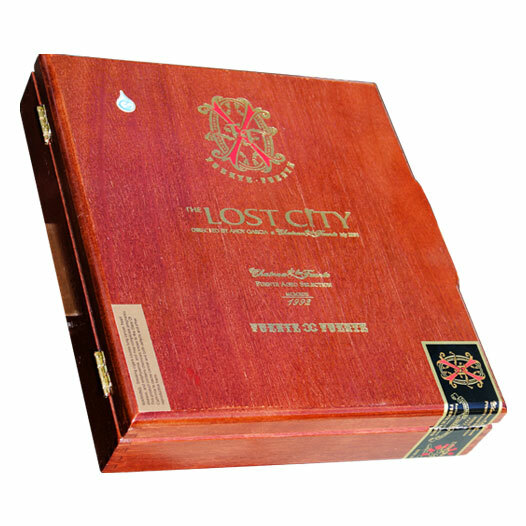 This was the inspiration for Fuente's Lost City cigar, which incorporates similar tobaccos used in the family's legendary OpusX blend, as well as the unique leaves grown in the summer months and shown in Andy García's film. These unique leaves have been aged for five years prior to being rolled into the finished product, therefore, only a small allotment is crafted for release each year. FFOX Lost City offers a full body and supreme complexity—a cigar worthy of life's biggest celebrations. Expect nuances of cinnamon, maple, zesty cabinet spices, leather, deep coffee, and toasted caramel.